Orion climbs through the trees and I move my camp chair closer to the fire, more for light than warmth. A full moon bathes the Forest Service campground, its pale light covering the ground like newly fallen snow. On this October night the temperature remains unseasonably warm, perfect for camping in late fall. 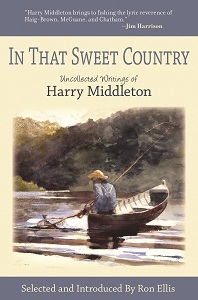 I relax by the fire with a cup of bourbon and a copy of In that Sweet Country (Skyhorse Publishing, July 2010, 208 pages), the recently published collection of essays by Harry Middleton. Middleton, one of the finest writers known to sporting literature, died in 1993. Now some 17 years after his untimely death, improbable prayers have been answered; there is a new Harry Middleton book to enjoy. It is a collection of 35 previously published stories, and one poem, written between 1983 and 1993, on the cusp of Middleton’s increasing recognition as a new voice in Southern sporting literature.The Great Smoky Mountains that surround me were Middleton’s true love and inspiration. He wrote of them often but never as beautifully or movingly as in his 1991 book, On the Spine of Time. Middleton regularly traveled from his home in Alabama to camp and fly fish in the Smokies. Middleton’s words run off the page and paint the landscape before me—words written 19 years ago about Hazel Creek, one of the streams he frequented in the Smoky Mountains. It is because I share Middleton’s addiction for cold water streams and trout, that I am visiting this sweet country. It was with some manner of discipline and restraint that I held off reading In That Sweet Country until I came to these same mountains. When I packed for this day on the water I put Middleton’s book in last so that it would be easily accessible fireside. This new collection of essays was pulled together by nature writer Ron Ellis with the assistance of Harry’s widow, Marcy. She told Ron that her husband had begun to make notes for a new book before he died. She thought the title of this work-in-progress was something akin to “In that Sweet County.” After going through his papers, though, she couldn’t confirm that. Still, the title was perfect for this collection. In That Sweet Country is a portrait of a man at work. From the late 1970s, until his death in 1993, Middleton was a working writer who wrote for a handful of newspapers and magazines, most notably Southern Living, where he crafted the “Outdoor South” column from 1984 to 1991. The three dozen essays in this book originally saw ink in 11 different publications, among them The New York Times, Sports Illustrated, Gray’s Sporting Journal, Field & Stream, Smithsonian, and others. Middleton’s three most popular books, On the Spine of Time, The Earth is Enough and The Bright Country are all fly-fishing related. While his first love is undoubtedly fly fishing, Middleton was a consummate outdoorsman. Something his grandfather instilled in him. When selecting pieces for the collection, Ellis sought out essays to showcase Middleton’s other interests such as deer and turkey hunting. These essays exemplify Middleton’s love for hunting, fishing and the outdoors. In That Sweet Country’s essays are grouped into six categories: Arkansas, Smoky Mountains, Days Afield, Journeying, Gadgets & Gear, and Wings, Wind & Wonder. They achieve the same lyrical heights as his books, and most of them are written for mass publication, meant to appeal to the non-sportsman. That they also appeal to the veteran hunter and fisherman is a testament to Middleton’s skills as a writer. For the new Middleton reader, In That Sweet Country is a great introduction to the man and his writing. In an interview with Southern Literary Review, editor Ron Ellis eludes that a second volume of essays is in consideration. One hopes that it is not another 17-year wait. As my fire turns to embers, I pour the remaining bourbon and read the final words of Middleton’s book. It is a bittersweet parting.